One Saturday night, I was in need of a quick dinner. I just so happened to have all these ingredients on hand. The sun-dried tomatoes can be found in your grocery store, in a jar packed in oil. The citrus-y tanginess of sun-dried tomatoes pairs well with the woody, saltiness of smoked bacon. Although rule of thumb says don’t pair your oaky Chardonnays with tomatoes, the complex roasted flavors of sun-dried tomato and this cream sauce really loved my bottle of Red Tail Ridge (Finger Lakes, NY) Chardonnay. Although, almost any dry white will do. Cook pasta & drain, as directed on box. Combine pasta with Rosa sauce. Take 5 slices of raw bacon and dice. Cook in skillet on medium to desired crispiness. Drain fat from pan when bacon almost done, then add diced onion and cook for 5 minutes. Add diced sun-dried tomatoes; cook for additional 3 minutes, then mixture remove from heat. This will be your “stuffing” mixture. Put a length-wise slit through the thickest part of the top your chicken breasts (Tip: this is also a good time to check that they’re cooked through) and spoon generous portions of stuffing onto chicken breasts. Top with slice of mozzarella cheese and place in oven for additional 3-5 minutes (until mozzarella melted). 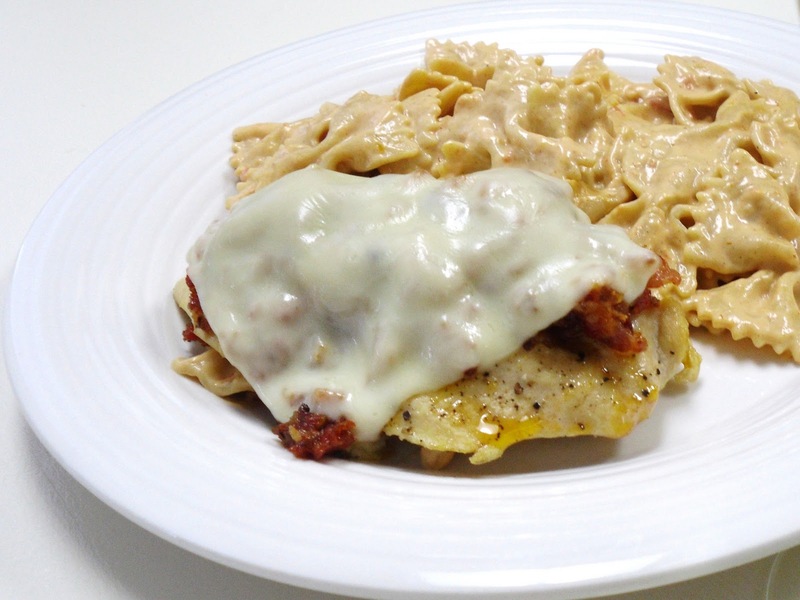 Serve chicken with pasta & rosa sauce and enjoy with a glass of Chardonnay or Pinot Grigio!